A kringle is a thin, delicate pastry developed hundreds of years ago in Denmark. 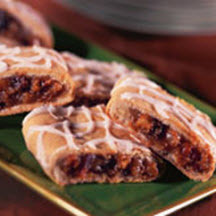 Kringles are hand-rolled using pastry dough that has been allowed to rest overnight before shaping, filling and baking. In a large bowl, combine flour and salt. Cut in butter. In a small bowl, dissolve yeast in warm water (105°F to 115°F | 40°C to 45°C ). In another bowl, combine eggs, 2 tablespoon sugar and buttermilk. Combine dissolved yeast with egg mixture. Add to flour mixture. Stir to make dough. Cover and refrigerate dough overnight. For Filling: Combine remaining granulated sugar, brown sugar, cinnamon, chopped fruit, cinnamon chips, Cream Cheese and chopped nuts in a medium bowl. Divide dough into 3 parts. Roll 1 piece into a 15 x 8-inch rectangle. Carefully spread 1/3 of filling mixture lengthwise across bottom half of dough. Fold over, pinch to seal and fold all seams underneath. Finished Kringle should be approximately 14 x 4 inches. Transfer to baking sheet. Repeat process with remaining 2 pieces of dough and filling. Place in a 375°F (190°C) preheated oven for 25 to 30 minutes or until golden brown. Cool to room temperature. Combine powdered sugar and cream. Drizzle over Kringle and serve. Tip: Cinnamon chips are available in the baking aisle of most supermarkets.